Tearfund and Clear Group have launched a new UK Aid Match appeal with help from the children at Clearly Kids Day Nursery in Bangor. They spent the day learning about the importance of recycling in the UK and around the world. Northern Ireland based health and childcare organisation Clear has joined with Tearfund to promote the appeal. It is backed by the Department for International Development’s UK Aid Match scheme. Match funding will be used to tackle plastic pollution in Pakistan and around the world. Donations made to Tearfund’s Matched Giving Appeal before 17th May 2019 will be doubled by the UK government, up to £3 million. Supporters will be able to donate in any Clear pharmacy, day nursery or dental practice. 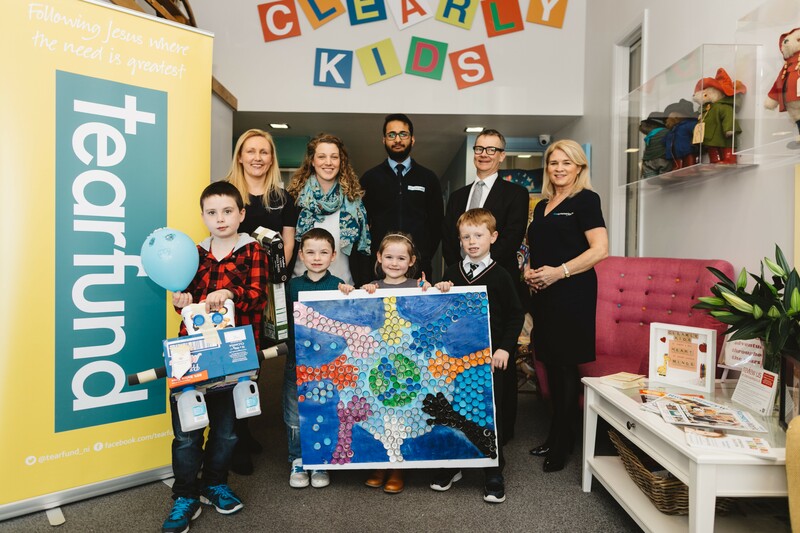 Barbara Dickson (Clear Day Nurseries), Ruth Koch (NI Director, Tearfund), Jeswin Kunjachan (Clear Pharmacy), Colin Johnston (Director, Clear Group), Audrey McCracken (Clear Day Nurseries) with children from Clearly Kids Nursery in Bangor, showing off their recycled art projects. Donations to this appeal will help Tearfund bring transformation in countries where the need is greatest. Match funding from the UK government will be used to tackle plastic pollution around the world. In Pakistan, for example, this funding will support Tearfund’s partners to set up recycling hubs and restore lives in some of the poorest slum communities. “Pakistan produces more than 20 million tonnes of rubbish each year and in cities like Karachi, two-fifths remains uncollected causing health and environmental problems. Our partnership with Clear and the generous funding from the UK government will allow us to transform the daily lives of people in great need.” says, Ruth Koch, Director of Tearfund Northern Ireland. Nearly a third of people in Pakistan live below the poverty line and rubbish is one of their biggest challenges. When rubbish isn’t collected it often builds up in rivers and causes flooding, which can lead to diarrhoea and a host of infectious diseases. Often the only other way to dispose of waste is to burn it in the streets, which is extremely damaging to health. With the help of the government’s UK Aid Match scheme, Tearfund will extend its work in some of Pakistan’s poorest slum communities to combat the problem, creating innovative recycling hubs so that rubbish doesn’t end up on the streets and in the waterways. In Pakistan this funding will help people like Rubina, who lives in a slum and works hard to earn enough income to look after her three children. With no rubbish collection in the community, rubbish builds up and can spread diseases. The piles of rubbish are also burnt, releasing toxic fumes and causing respiratory problems. Javed, one of Rubina’s sons, who lives with a disability, is particularly prone to this. They regularly have to take him by taxi to the hospital because his breathing is so bad. Rubina is worried about the health of her children and struggles to pay any medical bills. The creation of the new recycling hubs will improve the living conditions for people like Rubina, creating a cleaner and safer environment for her children to grow up in and also providing jobs for those in the local community. The funding will be used to tackle plastic pollution around the world. Donations can be made in Clear pharmacies, nurseries and dental practices. You can find out more about Tearfund or donate online on their website here.